Well, here we are. Mid-way through the month of October. The air is crisp, the leaves are crunchy…it's a great time of year. Here at Supernatural Central we're celebrating the change of the season by recognizing that it's getting darker. And we mean everywhere. At least in the northern hemisphere. 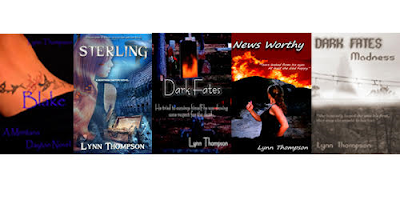 To bring more darkness into your life, today we're sitting down with author Lynn Thompson, to talk about her DARK FATES COLLECTIONS, which is really 3 books wrapped into one. BONUS! We were curious about the books, and asked Lynn a few questions. SC: Tell us about the main character in your book. LT: Dark Fates Collections is a book of short stories where every story has a new main character. SC: Aha! Got it. Lots of main characters. It sounds like the kind of stories you can read when you've got a few quiet moments, maybe before bed…or not. People always wonder why we're so fascinated by the mysterious. Do you believe in the paranormal? LT: I do believe in the paranormal and have had many paranormal experiences beginning when I was a child. Some of them fun. Some that made my skin crawl. My favorite was after my grandmother passed away. She would come visit me every once in a while. I would smell her perfume, feel her presence, and I got a glimpse of her silhouette once. She no longer visits me, but just knowing she was there if I needed her was a big comfort. SC: It seems to us that the more accepting you are, the more experiences you get. Fodder for the imagination, for sure. What are you working on next? SC: Okay, Lynn. Get back to work so we find out the answer, okay? Lynn Thompson's home is in the Land of Enchantment, and, yes, the land is enchanting. The skies are blue, the stars are bright., and there are beautiful panoramic landscapes surrounding her hometown.